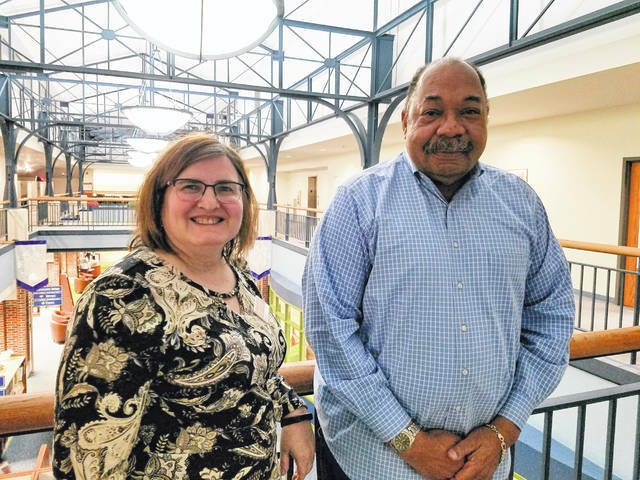 Pictured are Delaware County District Library Board of Trustees President Brenda Eldridge, left, and Vice President Michael Butler. At the regular meeting of the Delaware County District Library (DCDL) Board of Trustees on Tuesday, the trustees swore in the slate of officers for 2019. The board elected trustees Brenda Eldridge into the position of president, Michael Butler into the position of vice president, and Ceena Baker into the position of secretary. Trustee Holly Quaine was absent from the meeting, but she will be reappointed to a new term and sworn in during the February meeting. This will commence her second seven-year term on the board. The current DCDL Board of Trustees is made up of the following members: Brenda Eldridge (president), Michael Butler (vice president), Ceena Baker (secretary), Holly Quaine, Neil Neidhardt, Nick McCoy and Denise Martin. Other actions taken by the board included the adoption of a new credit card policy to comply with updates in Ohio law, the implementation of an Employee Assistance Program, and personnel items, including the creation of a full-time Team Leader position in the Youth Services Department. The DCDL Board of Trustees, the governing body of the library, consists of seven members who serve in non-salaried positions. The board promotes DCDL’s mission, sets library policy, hires and supervises the director and fiscal officer, approves the library’s budget and financial practices, and creates the library’s strategic plans. Four board members are appointed by the Delaware County Board of Commissioners, and three are appointed by the Delaware County Court of Common Pleas. Library Board of Trustees meetings generally take place on the third Tuesday of every month at 5 p.m. Meeting locations rotate. Locations listed below are subject to change. Check www.delawarelibrary.org prior to meetings for agendas and location information. Pursuant to Ohio Revised Code 121.22, all meetings of the Delaware County District Library Board of Trustees are open to the public and time is allotted on the agenda for public participation. For more information about the Delaware County District Library or its board of trustees, please contact Nicole Fowles at nfowles@delawarelibrary.org or (740) 362-3861.